The E-learning Group are hosting a mini conference on Inclusive Education on Wednesday 10th April at 1pm in E3, E-learning Training Room, Aber Academy. 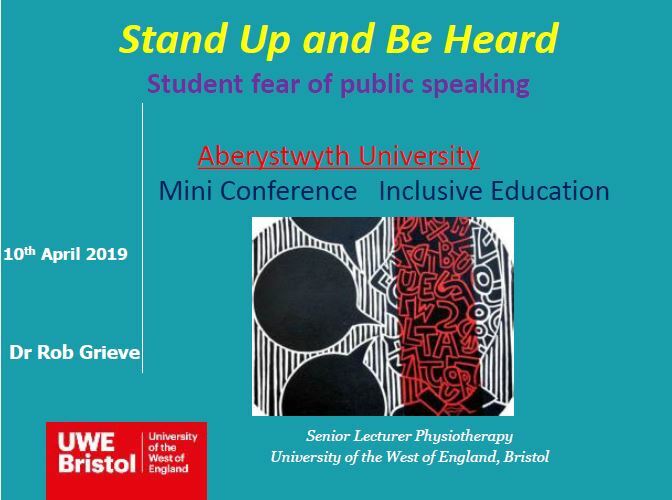 In addition to our previous blogpost announcing the line-up for the mini conference, we’re also pleased to announce that Dr Rob Grieve will be giving a recorded presentation entitled Stand Up and Be Heard: Student Fear of Public Speaking. Rob is a Senior Lecturer in Physiotherapy in the Allied Health Professions Department at the University of the West of England (UWE). In addition to his main research area and teaching activities, Rob is also a trustee of the British Stammer Association. As such, he has spoken at several events about the use of presentations as a form of assessment and equipping students with the skills necessary for public speaking. In this introduction, Rob will be drawing on a couple of his recent presentations that he has given at Advance Higher Education. Rob will also be reflecting on Stand Up and Be Heard workshops that he has been running for students with a fear of public speaking. The aim of the workshops was to support learning and teaching related to presentations and public speaking through specific strategies and a review of the overall benefits of public speaking as a transferable skill for university, life, and future employment. Rob builds on a survey conducted in 2012 which evidenced that 80% of students identified that they experienced social anxiety as part of assignments that involved public speaking (Russell and Topham, 2012). In addition to this, a further study (Marinho et al, 2017) identified that 64% of students had a fear of public speaking whilst 89% would have liked their undergraduate programme to include classes on improving public speaking. Further information on Rob’s work can be found on this blogpost. His Twitter handle is @robgrieve17. We hope that you’re able to join us at the mini conference. There are still a couple of places remaining. You can book onto these online. This entry was posted in Academy Forum, Conference by James Woolley [jbw]. Bookmark the permalink.